We were recently able to decode several more images of “The Land of Bodices”, which appear to show the early stages of the Dwarven settlement we are now calling Goodwhip. Rather than try to explain it myself, I will let the expedition leader’s words stand for themselves. As the last of the winter snows recede, our encampment breathes a collective sigh of relief. Now that the earth has softened, we are finally able to begin our digging and establish the foothold that will one day grow into a new Mountainhome, assuming we survive where so many others have not. I have ordered the smoothing of a trade route to allow our caravan wagons easy access to the Trade Depot, edged with gutters to draw away excess water. Things have been progressing well – my evaluation of Tulon as an excellent assistant have been spot on. He works tirelessly, digging without complaint, sometimes for several days at a time. 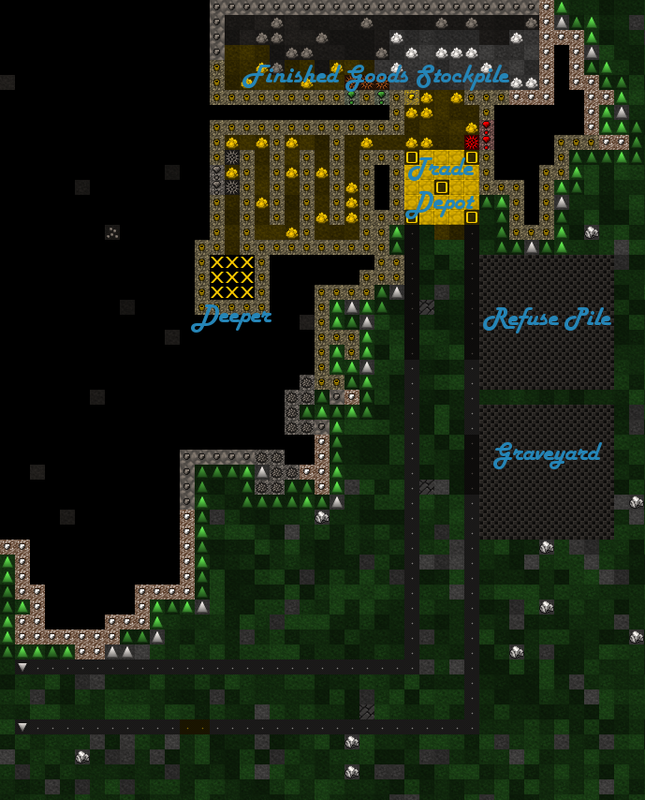 We have already completed our entrance tunnel and Goods-for-sale storage, both according to the Mountainhome standards. 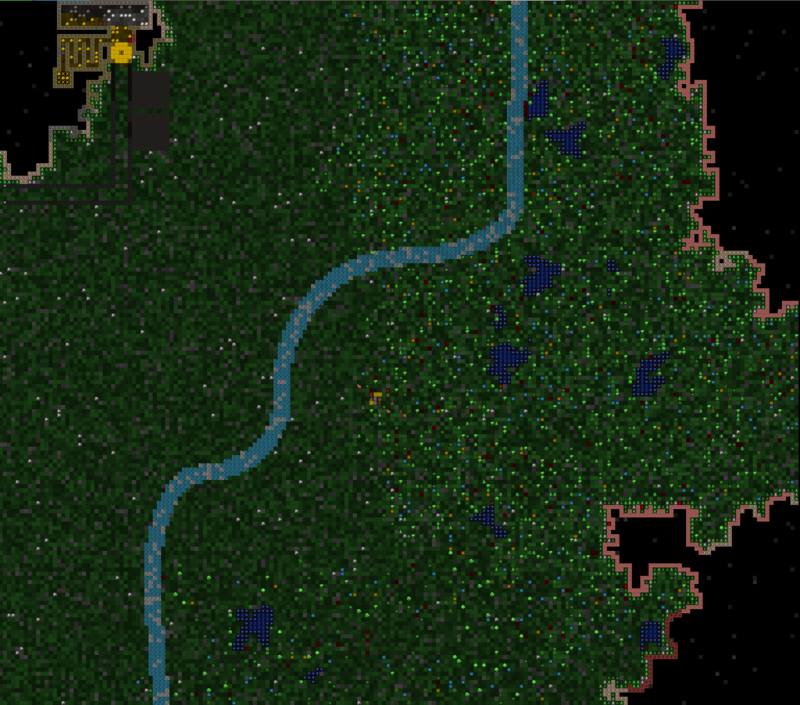 Soon work will begin on digging out the habitation and industry levels. The others have begun grumbling about being bored – it is true that these early stages depends heavily on the miners – but they should soon be occupied with their own essential tasks. I have assigned Atir to begin harvesting the local trees to provide the wood we will need for our furniture and storage areas, and Fath to the collection of whatever local plants seem to be edible. Additionally, Olon has volunteered to serve as our initial Mason and Onul will be taking on the role of our Carpenter. With any luck, we should soon be able to eat a proper meal at a proper table, followed by a restful sleep in a real bed. That would be welcome, as I am quite done with sleeping in the mud and detritus of our mining operations. The local wildlife has, thus far, presented us with little or no danger. A pack of Hoary Marmots wandered through our camp earlier, but we were able to shoo them off before they stole anything of value. I find myself unable to keep my eyelids open much longer, so I will have to close this entry here. May the next season bring us the same safe progress that we have enjoyed thus far. We have been able to produce two images of their dig site, one which includes the surrounding hills and a small stream, another which shows some details of their ongoing construction.